Sierra Leone's vice-president has put himself in quarantine following the death from Ebola of one of his security guards. Vice-President Samuel Sam-Sumana is set to become acting president later Sunday when President Ernest Bai Koroma leaves Sierra Leone to attend a European Union conference on Ebola in Belgium. Sam-Sumana will carry out his presidential duties from his home. He is the highest ranking African official to be in quarantine in this Ebola outbreak in West Africa, which is fast approaching a death toll of 10,000. The news highlights the rise of new cases in Sierra Leone, which has experienced a setback in curbing the spread of Ebola. Sam-Sumana voluntarily decided to quarantine himself for 21 days following the death from Ebola last Tuesday of one of his security personnel. "This virus has affected thousands of our people and has nearly brought our country to its knees," said Sam-Sumana in a statement on Sunday. "We all have a collective responsibility to break the chains of transmission by isolating the sick and reporting all known contacts, by not touching the dead ... We cannot be complacent. We must work together as a nation to end Ebola now." Sam-Sumana's dramatic quarantine comes as President Ernest Bai Koroma reinstated restrictions on public movement on Saturday, in response the rise in new cases. Sierra Leone recorded 18 new cases of Ebola in the week ending Saturday, up from 16 new cases last week. This breaks the trend of declining cases in the country. Many of the new clusters are related to the capital's fishing industry. In one case a fisherman died at sea in early February and the boat returned his body to shore in Freetown, the capital. Some of the fishermen on the boat then returned to their homes in the shantytown surrounding the fishing wharf, causing new infections. 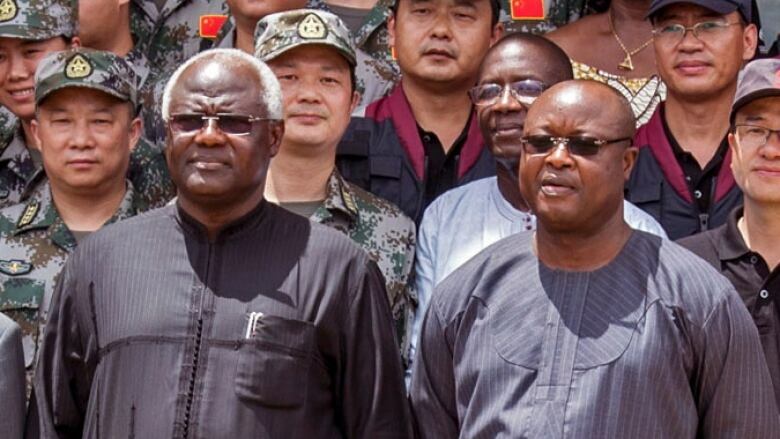 President Koroma had recently lifted travel restrictions in order to stimulate economic activity, a relaxation criticized as too early by some officials. In response to the rise in new cases, Koroma on Saturday re-imposed restrictions including a nighttime ban on all boats launching from shore and on commercial vehicles off-loading goods in western market areas. Naval vessels will enforce the measures by patrolling the wharves and coastline. In addition there will be restrictions on ferries and health checkpoints by the police will be strengthened. Public transportation restrictions will be reinstated which limit the numbers of passengers in taxis to two in cars and four at the back of large taxi vans to reduce physical contact between passengers. The death toll for the current Ebola outbreak has risen to more than 9,600 from more than 23,800 infections mostly in Guinea, Liberia and Sierra Leone, according to World Health Organization figures released Friday. Liberia, which has had the highest number of deaths, has succeeded in bringing its number of confirmed cases to just a handful and has reopened schools. Ebola is currently spreading fastest in Sierra Leone. In addition to battling Ebola, Sierra Leone's government last week launched an investigation after an audit showed that nearly one-third of the money it received to fight Ebola, about $5.7 million, was used without necessary receipts.